For those who desire a more extended lighthouse experience than a visit to one of our Open House days, Goose Rocks can accommodate up to 6 guests for an all-day or overnight visit as a token of appreciation to those who support our mission of lighthouse preservation. Donations to Beacon Preservation fund 100% of its expensive restoration and upkeep, encouraging us to make Goose Rocks available to those whose financial support provide the foundation for lighthouse survival. Such dedication to lighthouse preservation is often accompanied by a strong desire to experience a real �slice of lighthouse life� with a prolonged visit, offering visitors a chance to absorb the beauty of the Fox Islands as the Goose Rocks lighthouse keepers did for nearly 80 years. In 2006, Beacon Preservation took over the preservation and management of Goose Rocks Lighthouse off North Haven, Maine. Goose Rocks is a 51-foot �spark plug� or �coffeepot� design cast iron offshore lighthouse. Located in Fox Island Thorofare between North Haven and Vinalhaven, Maine, Goose Rocks was built in 1890. The lighthouse has floors inside the cast iron circular shell, most of which is lined with brick walls unless otherwise noted. 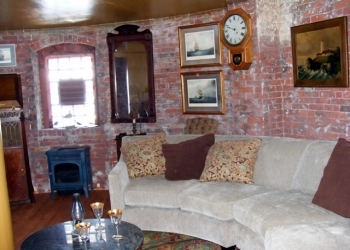 When possible, a balance of original detail, historic accuracy, and modern safety and convenience have allowed us to furnish most of the lighthouse with antiques and d�cor appropriate to the turn-of-the-century era in which Goose Rocks was built. Scrapbooks, prints, and showcased mementos from Goose Rocks make it a habitable museum to be wandered and appreciated. The "Keep" is at ground level, a cellar-style 22� diameter room with brick-walled storage alcoves, dining table, Aga stove and kitchen area, and eco-friendly bathroom facilities. The "Sitting Room" is the heart of the lighthouse, on the first-floor catwalk level, 18� in diameter, and the first thing you see as you enter through the main door from the main covered deck. It offers a cozy ambience and comfortable seating for 8, with propane parlor stove, wind-up Victrola, writing desk, bookcase, (holding cache of books, games, movies, and music). An �aero-bed� is provided for overflow sleeping arrangements on the floor when necessary. The landing in the front entrances of the sitting room offers a curved staircase downward to the Keep, or upwards to the Keeper�s Quarters. The "Keeper�s Quarters�, at the second level is 18� in diameter, featuring a queen-sized bed with nightstands, linen chest, writing desk, armoire, and reading chair, with three full-sized windows overlooking the Thorofare. The staircase at the landing continues upwards to the next bedroom. 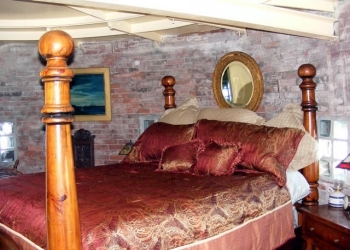 The ''Captain's Quarters" at the third level is also 18� in diameter, with brick-lined walls and architectural iron ceiling showing the intricate construction of Goose Rocks. It offers a queen-sized bed, dresser, writing desk, and French vitrine; six portholes around the circumference offer diffuse light from all directions. A slanted ladder in the Captain�s Quarters takes the hardy up through a hatch to the bunkroom. The "Crows Nest" bunkroom: maple bunk beds on the 4th level provide overflow sleeping or lounging quarters for two extra people; the room is 10� in diameter and lined with original beadboard panels, featuring a door leading out to the watch deck, and a ladder leading up through a small hatch to the lantern. "Beacon Room": this room is the pinnacle of the structure, only 6� in diameter, and houses the flashing light mechanism to guide navigators through the thoroughfare at night. The upper walls of the hexagon room are composed of red-tinted glass with a full 360� view of the Thorofare, with a marble bistro table and two chairs for those who wish to linger with book or play cards with a friend. A small hatch on the lower half of one wall leads to the exterior beacon deck. 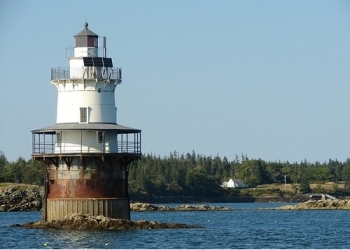 Goose Rocks Light was established in 1890 at the eastern entrance to the Fox Islands Thoroughfare, a busy waterway between Vinalhaven and North Haven islands. The Fox Islands, over 50 in all, were named by explorer Martin Pring after the silver foxes that were common there. Goose Rocks Light is a typical "sparkplug" style cast-iron lighthouse of the era, built on a round cast-iron caisson filled with concrete. The tower, which has three stories inside, originally had a fourth-order Fresnel lens. The tower was painted red until 1903; today the caisson is painted black and the tower is white. The light was automated in 1963. After automation, for a time there were local people, called "lamplighters," employed to control the fog signal at the lighthouse. According to Samuel Beverage of the North Haven Historical Society, "Alton Calderwood and his wife, Annie, also Elmer Carver and daughter Marion (Carver) Hopkins served as lamplighters. They lived at Little Thoroughfare not far from the light and were aware of the fog conditions." The Fresnel lens was removed; there is currently a modern 250 mm optic. The light is now solar powered. The lighthouse was expected to be turned over to the town of North Haven or a local organization under the Maine Lights Program in the 1990s, but there were no applicants. In June 2004, it was announced that the lighthouse would be transferred to a suitable new owner under the National Historic Lighthouse Preservation Act of 2000. In 2006, the high bidder was Beacon Preservation, Inc. of Ansonia, Connecticut.